Classical Net Review - Selections from "English Dancing Master"
The program of 20 short pieces from John Playford's (1623-1686 or 1687) "English Dancing Master" was recorded in 2002; but released this year. [It appears that this recording was originally released in 2002 on Alpha 502, and then subsequently released again in 2012 on Rewind REW503. -Ed.] 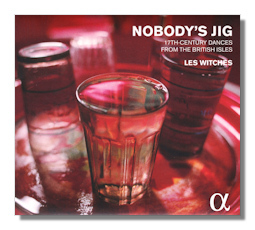 It marks both the arrival of violist, Sylvie Moquet, to Les Witches and their first recording for Alpha. The aim of this French group of five instrumentalists is specifically to reproduce and recreate the ambiance and soundscape of the inns and taverns of Shakespeare's time through, as their website says, "research, memory, intuition and improvisation". The other members (Odile Édouard, violin; Claire Michon, recorders and flutes; Pascale Boquet, lute and guitar; Freddy Eichelberger, harpsichord and cittern) had been playing together for ten years before the decision to record this collection, for which they had established significant momentum. Those plans were thwarted by the events of September 11 2001. This collection is not, though, some vague pastiche or "jazzed up" impression hovering on the barriers between folk and art music without really being sure of its audience. Here is precision, musicianship, a delight in improvisation and ornamentation and an intelligent concern for authenticity, balance and respect for the melodies, textures and pace of Playford's collections. Yes, there is springiness; there is spontaneity; there is a determination to expose the life in this dance music as surely Playford himself must have intended. But not to try and add spurious effect or any kind of self-consciously modern gloss to it. Indeed, the pleasure which one derives from this music is much more in its detail than in any sense of over generous "feel". For there is apposite ornamentation, subtlety, careful articulation, judicious instrumental combinations – especially of woodwind and strings, perhaps when you'd expect more overtly boisterous timbres than here are crafted. It's obvious from the first few bars of this infectious music that these performances benefit from having been refined and sifted, examined and analysed over many years of playing. There is, though, no hint of staleness or over-protection. The vibrant world of Playford and his sources stands its ground perfectly. That French players can enter into the spirit of Playford so thoroughly must in part be an acknowledgement of the predominance of French dancing models during Playford's era. Les Witches are very creditable performers. The "English Dancing Master" was first published in 1651, a generation after Shakespeare's death of course. But it reflected music that had been current, popular and loved since the sixteenth century and earlier; indeed the Collection continued to be republished until about 1728. It contained literally hundreds of tunes (105 in 1651) collected as a manual for those wishing to perform English Country Dances. Cecil Sharp and the English Folk Dance Society picked up on Playford; in fact some of these dances are still used today. One of the most striking aspects of the Playford collections is their variety. Listen to the slow, almost doleful, yet clean rather than lugubrious Mask Number 6 [tr.12], followed by the poignant Drive The Cold Winter Away, often heard as a Christmas Carol nowadays. These two demonstrate as well as any others Les Witches' sensitivity to the nuances and subtleties of this music, which could so easily be mistreated as a romp. Never seeming to feel the need to overstate anything, the musicians expose a number of pleasing and apposite qualities of the music: the interweaving of melodic lines; the consequent sophisticated harmonies; the ways in which instrumentation (insistent, rather than pounding percussive accompaniment) re-inforces a sense of direction, climax and musical purpose; and the sense that the music "turns in" on itself through studied repetition – for all its purpose as dance music. These are displayed carefully yet with gusto by the musicians. Perhaps at times, there is just a hint of the staid where something more free and flinging would have worked just as well. But their approach never lacks musicality. Although superficially exuberant and at times jolly, none of this music should be thought of as slight. Listen to the tones, the sensitivity of "Woodycock" [tr.15], for instance. It's slow, melancholic and entirely self-referencing. Les Witches do it real justice. As they do the following, equally subtle "Wallom Green" (with its distinctive textures) and the "Piece Without Title" (with its reduced instrumentation) [tr.s 16, 18], and "Bravade" [tr.17] for that matter. Each of these more thoughtful melodies becomes memorable for its very real pathos as for anything merely "tuneful" and "merry" about it. The CD's acoustic, that of the church of Saint-R&eecute;mi in Sérigny, France, is just resonant enough to support the genuine spirit which these musicians bring to the works here. But it does not create a sense of staged performance. It favors the woodwind and higher registers of the stringed instruments, so emphasizing brightness; this is entirely appropriate. The booklet carries only a track listing, details of the instruments played (all but Édouard's violin are modern copies) and the transcript in French and German as well as English of an interview with the performers. The latter serves well to set out what Playford achieved, what he did not ever intend to achieve, and just how influential was his work… it found fertile ground in sacred, as well as secular spheres, for instance. There is something new, exciting and fresh in these performances, however well you know the Playford corpus. If you're new to it yet love the period and its variety of genres and aggressively imaginative repertoire, this CD will not disappoint.